August 12, New York: My greatest regret with Neuromancer is to have discovered it after the derivative works, which are legion. By the time I read this novel for the first time I’d already seen The Matrix, I’d already found it impossible to separate the razorgirl Molly from the mental picture of Trinity. It’s just a great book. Fun to read and packed solid with future-y details and little side-mentioned predictions. A perfect near-future science fiction novel. I’ve since taken my own stab at this with The Collective, but I find my own work incredibly lacking when held up to the standard here. It is most fun to guess at what Gibson accurately predicted was actually influenced by the book itself. I bet no small number of things. Borrowed terminology, etc. I’m still waiting for Oculus Rift to turn into 8-bit Atari Internet surfing, though. 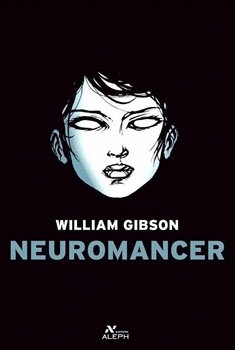 Never read Neuromancer? Heard it was a rip-off of The Matrix? No! Quick! Go buy it off of SenseNet and download it into your psyche! This entry was posted in Books, Reviews and tagged A Long Waltz Through Nerddom, The Collective on August 12, 2014 by magicandrew.